Goalie Sale Going on now! If you’re a goalie (or happen to do all the shopping for one), now is one of your favorite times of the year – our goalie sale in-store! Perani’s Hockey World Goalie Sale only happens once a year, and this is it! 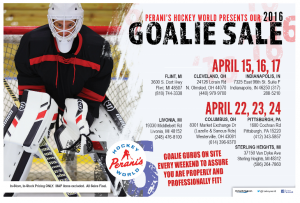 Starting (April 15) through April 17th our stores in Flint, MI, Cleveland, OH and Indianapolis, IN will be going wild with all of our goalie sales. We will have some of the best prices imaginable on some of the top names in hockey equipment. April 22, 23 and 24 our stores in Sterling Heights, MI, Livonia, MI, Columbus, OH and Pittsburgh, PA will be having the same sale. Our goalie gurus and experts will be in all the stores, offering tips and advice on all the latest and greatest goalie equipment, while making sure you get fitted properly and professionally. Our goal at Hockey World is to make sure you have the latest and greatest gear with the best prices available, not to mention equipment that is fitted for you specifically so you can continue to do great things on the ice. Whether you’re in need of new protective gear, new skates or hockey sticks, or you just want to come in and see what the deals are, it’s worth the trip in to any of our stores listed above. Customers always get our best-price guarantee at Perani’s, but this is even better. This annual sale is valid on in-store and in-stock merchandise only and all sales are final.